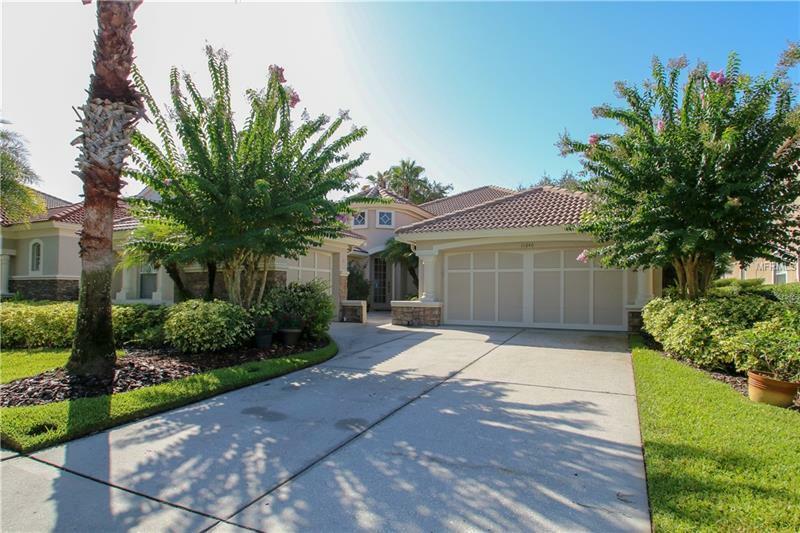 Stunning home in the prestigious gated community of Waterchase. This beautifully maintained home has 4BR, 3BA, family room, formal dining and living rooms, split 3 car garage with a courtyard entrance and fenced backyard oasis. As you walk in, you will notice the archways, decorative columns and hardwood floors throughout. Gourmet Kitchen w/granite counters, 42' cabinets, built-in oven, gas cooktop, microwave, refrigerator, breakfast bar, recessed lighting overlooking the large family room that has a built-in entrainment center and triple sliders to the lanai. Large master suite with a tray ceiling, walk-in California closet system, garden tub, separate shower, and double vanity. Large secondary bedrooms the 3rd bedroom is ideal to be used as an office or guest suite. The outdoor living space is fenced with lush landscaping, accent lighting, extended travertine tile patio and an outdoor kitchen. Full house water filtration system & water softener, ceiling fans, security system. New A/C, new hot water heater. This home has it all and is move in ready. Waterchase is a master planned community with 24 hour gated security, two swimming pools with 2 story slide, fitness center, basketball/tennis courts, soccer field, and playground. There is a full-time Activities Director on site with after school & summer programs. Easy Access to Tampa International Airport, major highways, beaches, shopping, and dining. Pet Restrictions: Verify all information with the Waterchase HOA Association.